We take the liberty to quote here at length the great German author Albert Vigoleis Thelen, on decay. We found a stump of a cypress tree washed up on our beach one morning. Its close-set branches had been cut off. The longer we looked at it, the more it appeared like a club, bristling with lethal knobs (see photo below). It laid around our garden for a few years, with the bark gradually sloughing off, and an idea germinated. It was so heavy that one couldn’t pick it up by its narrow end and wield it like a war club, but perhaps a mythical giant warrior could’ve done so. Each of the cut-off branches might have been decorated with the faces of the enemies he’d slaughtered with it. Research resulted in a collection of images of early-medieval warriors from Norse carvings, ancient Roman coins, and tapestries. We rounded off the cut ends of the branches and used oil paint to decorate them with the faces. 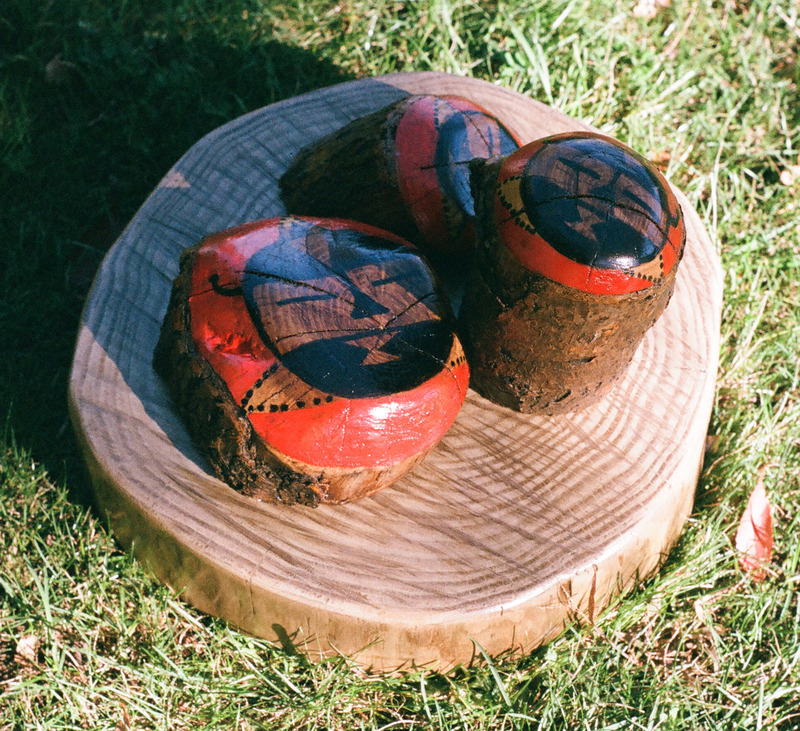 The whole was then polyurethaned to bring out the delicate color and texture of the wood. 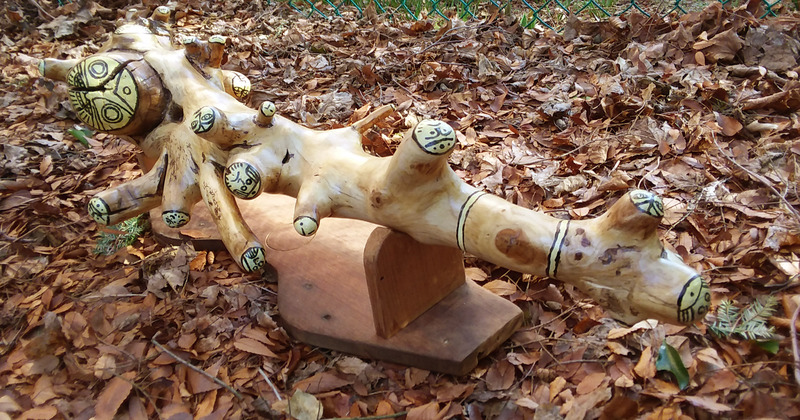 Sculpture by Dave and Sharynne Wilder – cypress stump, oil paint, and polyurethane; mahogany and teak base. Lower photo copyright ©2014 by Katrin Grimm. All rights reserved. One of the many pieces of flotsam from the classic motor yacht we dubbed “The Mae West” to wash up on our beach was a narrow teak cabinet door, with a solid teak frame and teak plywood inset. We decided to use it as the top of a side table, making the legs from a solid teak 4 x 6” slab that had been purchased for a boat project and never used, and a lower shelf from another 1 x 6” teak board, from the same yacht. To fill the inset we cut a strip from the nautical chart of one of our favorite cruising areas: the North Fork of Long Island, New York, and Shelter Island. This is covered by a sheet of plate glass. Neighboring our former waterfront home is a restaurant parking lot, the source of excessive amounts of noise from its denizens, including very loud music, yelling and screaming, and fighting. It’s The Bronx. Screening us from the lot, and muting much of the noise, was a thick stand of Leyland cypresses, a tree known for is sound-absorbent quality. But Hurricane Sandy uprooted and killed almost all of these beautiful trees, exposing us to not only the noise, but the staring eyes of the restaurant-goers. We decided to create a privacy screen utilizing the bamboo thicket that had invaded our landlady’s yard across the street. 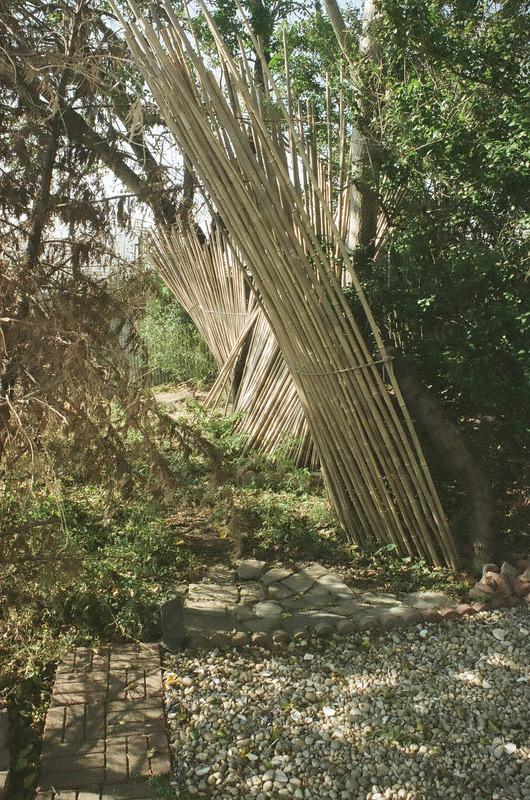 We wanted a whimsically sculptural look, and achieved it by roping together the bamboo stalks into a “fence,” supported by existing trees and heavy limbs of our mulberry tree (also a victim of Sandy) planted in the earth. Thus we created our “Bamboo Curtain,” named in reference to the existential barrier of the Chinese during the Cold War. To enhance the symbolism, we made the heads of the mulberry posts into painted images of Ban Po “guardians,” based on the earliest-known art found in China, from the Neolithic Period. 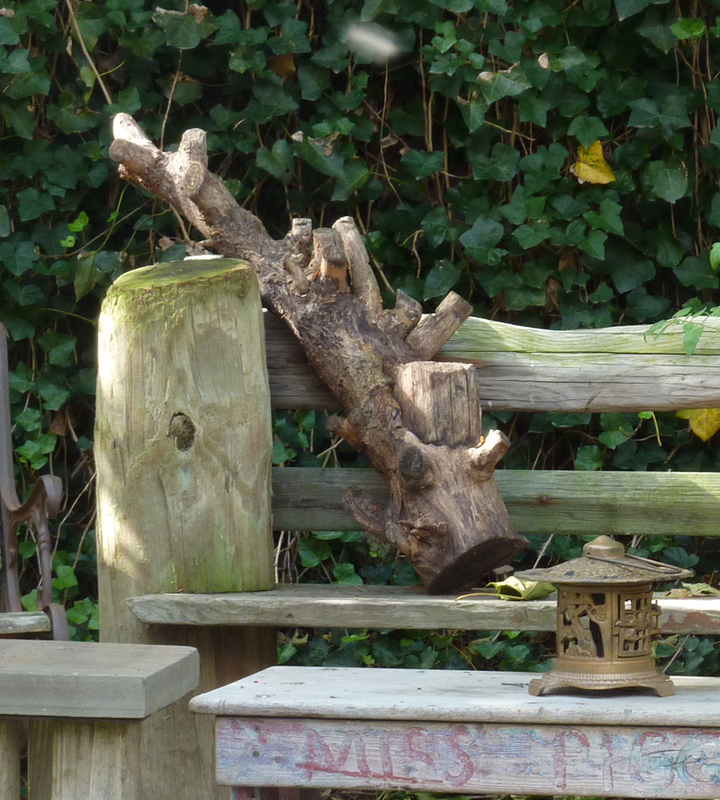 Way back in December of 2013, we posted a photograph of a small pile of dockwood in its original state that we planned to turn into our third Dockwood bench (see below). We fabricated the bench in 2014, and after finally photographing it last year, we’re getting around to posting it here. It’s a two-person, “love-seat” kind of bench, its width determined by the length of the key piece of lumber that was perfect for a backrest. We’ve moved our posts on three of our sculptures, “Sketches for a Sculpture in Progress,” “See-Snake,” and “Football Hero and His Fairy Princess Girlfriend By their Special Rock” to our Sculpture page.